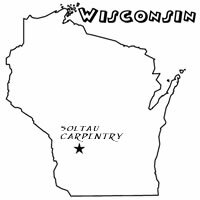 Founded in 1980 our company has been providing southwest Wisconsin's homes, businesses and schools with high quality cabinetry and woodworking for over 37 years.
" If you can dream it... we can build it". We are a small company dedicated to maintaining high quality in our products. We take pride in our work and our customer's projects from beginning designs stages through fabrication to final installation. Our goal is to achieve 100% satisfaction for our customers.